Brandon: So, Darius, you’ve been writing for Baseball Prospectus for a little while. How many wins does PECOTA project for the Cubs this season again? B: And…what place is that? B: But wait, this team won 95 games last season and is basically running back that team. What gives? D: For me, it starts with the pitching staff, particularly their age. PECOTA thinks the Cubs will allow 745 runs, which is more than all but the Reds or the Marlins in the National League. When those are your comps, it’s not good. There are 7 players on the pitching depth chart likely to get significant innings who are 33 or older, and that’s rarely a good thing when it comes to projection systems. In particular, Jon Lester is a 1-WARP player over 180 innings, and that’s a big chunk on a guy who PECOTA now thinks is barely above replacement level. B: I guess it doesn’t help that the rest of the NL Central added significant players this offseason (Paul Goldschmidt in St. Louis, Yasmani Grandal in Milwaukee, all the ex-Dodgers in Cincinnati) while the Cubs stood pat. D: It doesn’t, and that’s the other big factor to consider here. Both BP and FanGraphs have fewer than ten wins separating the entire division, so in that sense the systems agree that it’s going to be close. Each of these teams will be above .500 in a fairly significant number of the projection runs. B: So, ok, I get that pitching regresses and it gets particularly dicey when you’re talking about starters over the age of 33. But there are other projection systems (hey FanGraphs!) that have the Cubs at the top of the division rather than the bottom. What accounts for this difference? D: FanGraphs projections – based on Steamer and ZiPS combined with a manual playing time adjustment – do like a lot of Cubs players a little more than BP. They add at least half a win to each of the starter’s projections, for instance, and more than a full win to Lester. Some of that is tied to Deserved Run Average (DRA), which evaluates pitchers differently to these other models, but it’s also because FanGraphs tends to be a little more aggressive on playing time projections than BP, I think. D: Yes, there’s some disagreement on the hitting side too, perhaps most notably with Kris Bryant. DRC+ has never liked Bryant as much as WRC+, but that was particularly the case last year when it had him as not far above average. Bryant is projected to slug 30 points lower by PECOTA, and that’s the chief reason why he’s slightly below 4 WARP but over 5 on FanGraphs. PECOTA doesn’t know about Bryant’s shoulder, of course, so if you’re inclined to believe that he’s fully over that, there’s reason to believe more in the FanGraphs take. B: Hm, so Bryant is like the Cubs and projection systems in a nutshell. Either super optimistic or gloom-and-doom — these also happen to be the Two Moods of Cubs Twitter. D: Pretty much. PECOTA seems to take the doom-and-gloom angle with most of the players except Anthony Rizzo, who is a DRC+ darling with his outstanding approach. B: But it still seems like the Cubs have SOMETHING of a high floor? D:I think there’s a reasonable argument to be made that their ideal roster is still as good as any in the division. But this brings up another issue, which is depth. There really isn’t a ton there behind the regular starters, especially for the pitching, and a few less innings for that front five essentially means more going to the limited replacement-level options the Cubs have. B: So, I’m a torn Cubs fan. What should I believe here? D: I don’t think you should be under any illusions about the division. The Cardinals and Brewers both have better depth, in my opinion, and star power to at least come close to if not match the Cubs. B: Well, this certainly makes me feel better about 2019. Any final thoughts that will make me even more depressed? D: There’s also the Willson Contreras question, which is less of a glaring difference now that FanGraphs has introduced framing, but I do think it has a massive effect on how the pitching fares. B: Ok ok Darius that’s quite enough piling on!! Is there anything I should actually feel good about this season? D: I do think that PECOTA is a little harsh on the likes of Kyle Hendricks, who it rates as barely an average player, and that if you think Bryant’s healthy and Javy Baez simply has the kind of unique approach that enables him to defy what his plate discipline numbers suggest, you’re probably already at a mid-80s win total. B: That makes me feel…a little better. Thank you Darius for deepening my understanding while also making me feel slightly worse about 2019. D: No problem, any time! What is the Cubs’ most recent accomplishment? It’s been an eventful offseason for the Cubs to say the least, but despite everything that’s happened, the team still won 95 games and went to the playoffs for the fourth year in row. 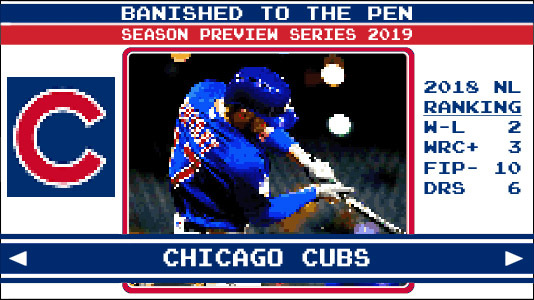 How do the Cubs define success in 2019? The most Effectively Wild player on the Cubs: Kyle Schwarber. Per his annual end of the year press conference, Theo Epstein put a few of his young players “on notice” going into 2019, as he put an emphasis on production (or lack thereof) vs. potential. The most interesting player to watch this year is Kyle Schwarber because after 2 full seasons in the majors, we’ll start to assess what kind of player he really is. Is he a career .220 hitter who hits 20 home runs or a .275 hitter with 35 home runs? Everyone in the Cubs front office is eager to find out the answer, especially Theo Epstein who will be strongly advocating for his left fielder to be granted more consistent playing time. If you want the coolest giveaway in 2019, come to Wrigley Field on April 13th against the Los Angeles Angels for your Cubs & Star Wars Blanket! The reasons should be obvious: see the best player in baseball (Mike Trout), uncover interleague play at Wrigley Field, and be the first person to experience comfort and warmth by a Stormtrooper. Is it still a dynasty? Own it now, to see. John is a lover of sports, comedy, and cooking documentaries. He recently moved from Chicago to Los Angeles where he's now considered morbidly obese. John is willing to become a fan of any MLB team that will employ him in their front office. Currently, he works as a Social Media Manager by day and a comedic superhero by night.